So many questions. First, why set a film that’s predominantly underground, in Venice, the City of Bridges? You might as well recreate a gritty 70s New York hellscape in a suburban Long Island bungalow. Now, this is a dystopia, a Venice in which they’ve circumvented the engineering problem of what is essentially a highly unstable mud lagoon and built a vast network of catacombs. A highly underwhelming (and we can’t stress this enough) military tactical force is sent into the depths to investigate and they’re known as Megaforce. They dress in “business casual” versions of Michael Jackson’s Thriller get-up and are named Kowalski, Franzini, et al and make horrible ethnic jokes at one another’s expense. They’re given a debriefing in a room that looks like the waiting area to renew a driver’s licence and the intrepid crew heads out, with a member of Tubular Corporation in tow, a company that is contracted to help remediate a poisoned city. Turns out the corporate stooge is not what he seems and that the company’s behind some nefarious virus. 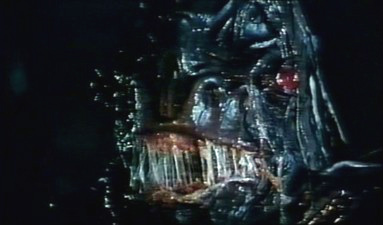 What lurks below is the result: highly un-foreboding (and extremely cheap-looking) Alien-like creatures, complete with fangs, goo and a lousy temperament. Megaforce takes them on with ample firepower and an array of action film dialogue clichés (“what does he wanna do, get himself killed?”, “we’re gonna get you outta here, I promise”). You either come with us, or I’ll blow your head off. 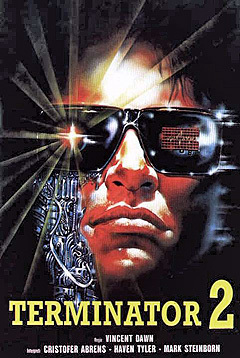 Years before starting this site, we’d encountered movies with far worse dialogue (hard to believe given the above, but actually not many), worse special effects (again, not many) and worse acting (a few dozen) but Terminator 2 Shocking Dark can plant its flag at the crest of having the most appalling cinematography we’ve ever encountered. Poorly lit, muddy, and uber-cheap (it was a shock to find out this was lensed in ’89) it has the aesthetic shared by Bruno Mattei’s other glorious rip-off, Strike Commando (though that had the benefit of being shot during daylight to make sense of what was going on). This entry was posted in Science fiction and tagged 90s movies, horror directors, horror podcast, Italian cinema by Really Awful Movies. Bookmark the permalink.